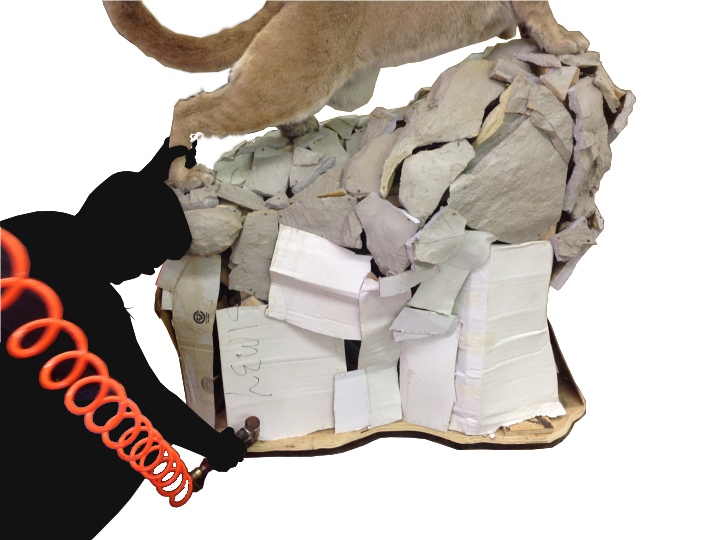 The following shows how to create a mount base for two different animals using Spray Foam. 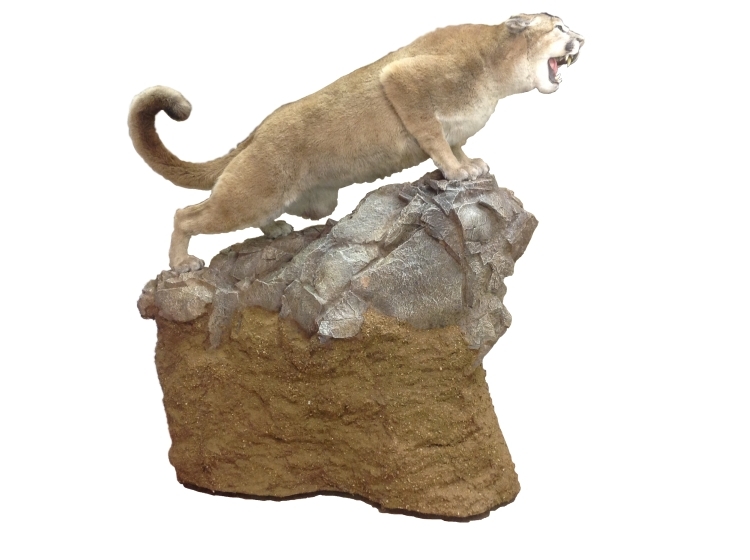 Specimens include a mountain lion and a bobcat. 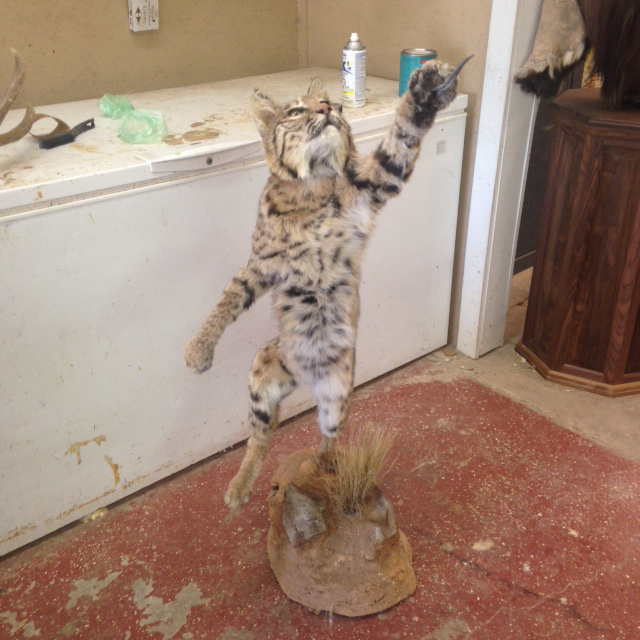 The basic taxidermy pedestal base plans, outlined below, show how to create a mount, spray foam over the corrigated cardboard box, and finish it out with dirt, grass, foam rocks, etc. 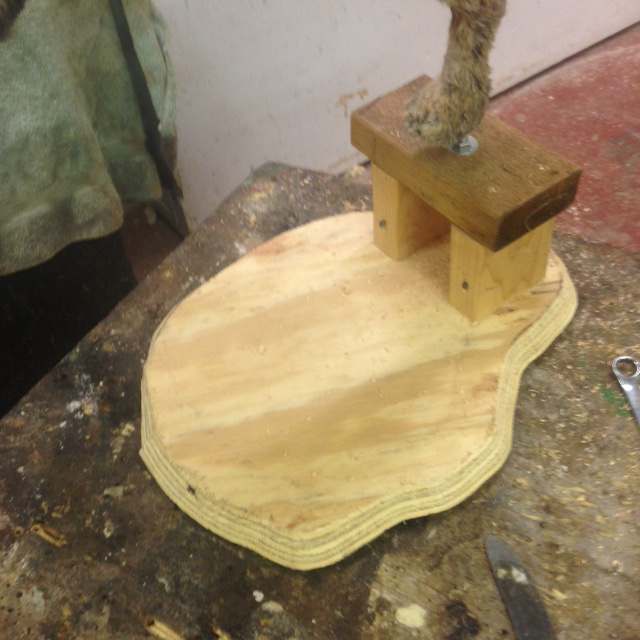 Start with a wooden frame and add cardboard to create a base from which you will add spray foam. 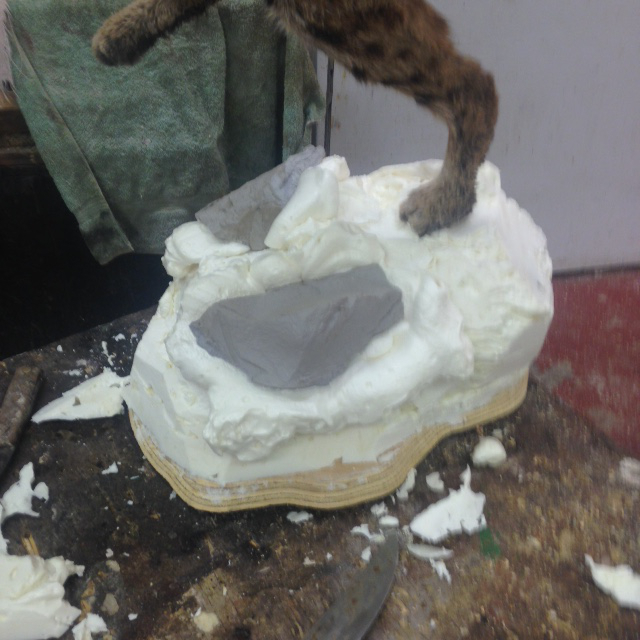 You can also add rocks made of foam at this stage of the taxidermy process as well. It doesn't have to be perfect here as you will be spraying over most of this structure, but this is the first step in how your base will soon take shape. Then, mount the specimen ontop. As you prep to use the spray foam, make sure to follow all of the best use guidelines for foam: make sure the temperature of the spray foam is within 75-85 degrees, spray a test shot into a trash can to ensure you have a full spray coming from both components, and open both valves fully. 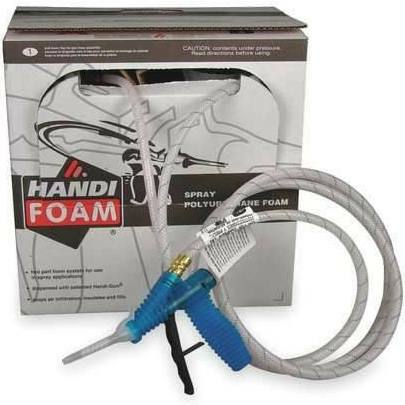 Using a closed cell spray foam kit (FOAM105, FOAM205, or FOAM605 kit), spray and mold the foam into the desired shape for your mount or base. Closed Cell foam is very firm and provides excellent structure from which to craft your base to exactly your specifications. If you cut away too much, you can always spray more ontop! When you are spraying foam, be sure to follow the 30 second rule: if you have been spraying for any amount of time and you stop spraying for 30 seconds or more you must replace the tip that is on the end of the gun to avoid clogging up the tip, gun or even the hose. Also, be sure to spray 12-18 inches away from the surface and move at 1 foot per second to get a good expansion and cure. You should get the hang of how much the foam will expand as you mold your base into a perfect base for your specimen. Be sure to always follow proper personal protection guidelines. Always wear a respirator, goggles, gloves, and a coverall while spraying foam. Finally, if you have to take a break, be sure to leave the spent tip on the end of the gun until you are ready to spray again. Then, put a new tip on the gun and start spraying again. Each kit must be used every 7 days to keep the hoses fresh. 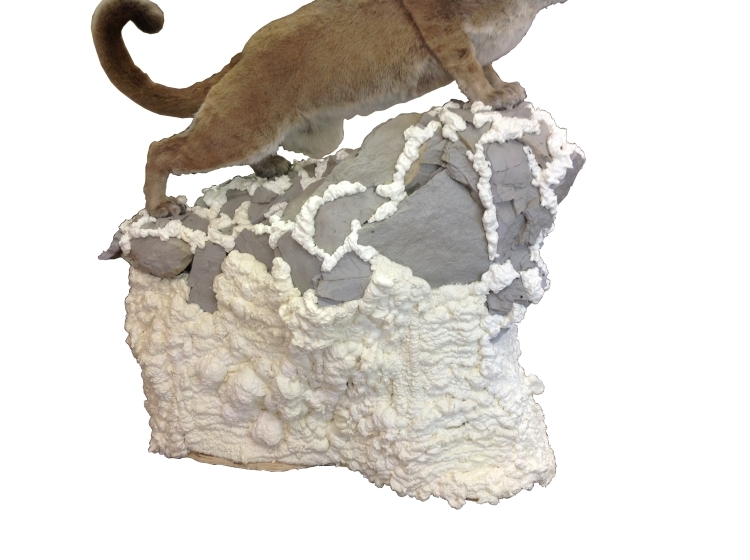 Finish the base or mount using paint, dirt, grass, foam rocks, and other artistic touches. As the tanks start to empty out, it is normal to have some sputtering. When the consistency of the foam starts to change, it is time to stop to avoid spraying off-ratio foam. Disposal of the tanks is the same as how you would dispose of a can of paint -- find your local hazardous materials disposal center and drop the tanks and hoses off there. 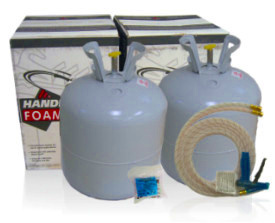 Spray foam comes in many different types and sizes. Closed cell foam has a firm consistency but is easy enough to cut and whittle with a knife. It is paintable, and provides structural integrity for any form. A FOAM105 kit will cover 105 square feet at 1 inch of thickness, or a volume of 8.75 cubic feet. This is enough foam for roughly 40-50 bobcat habitat bases or 80-100 13" wide deer pedestals sprayed at 1-1.25 inches thick. For an even better unit price, the FOAM205 kit will cover 205 square feet at 1 inch of thickness, or a volume of 17.08 cubic feet. While it comes in the same box as the FOAM105, it yields twice the foam at only 1.5x the cost as the FOAM105 kit. Finally the FOAM605 kit is for the serious taxidermy business with a consistent stream of projects or for taxidermists who make bases for big game. This kit allows for quick use of six times the amount of foam as in the FOAM105 kit. Finally, it is also possible to get spray foam in a black color. While we do not list this foam on our website, our Commercial Vehicle products come in the 205 and 605 sizes. If you would like more information, call us at 1-877-464-5828 for more information or to place an order with us.